Eric Cruickshank (15) reaches for the puck to gain possession from Michigan State at the Ice Arena on Friday, Sept. 22. 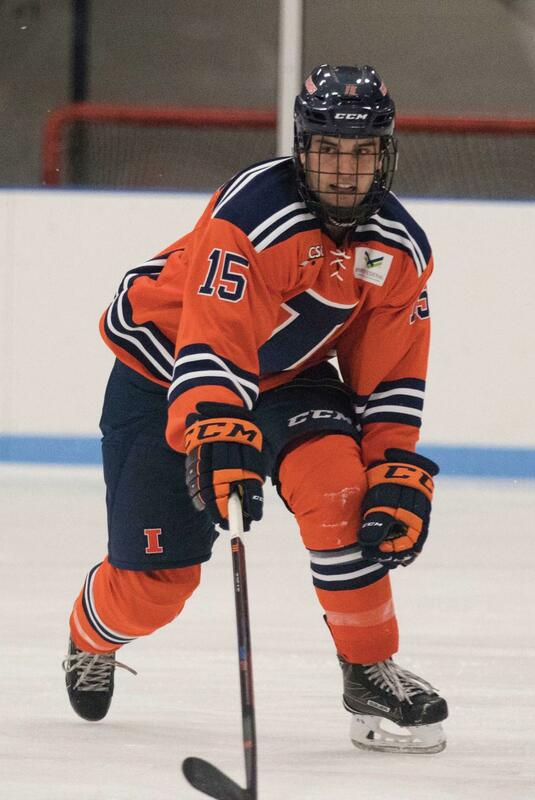 Illini beat MSU 4-1. 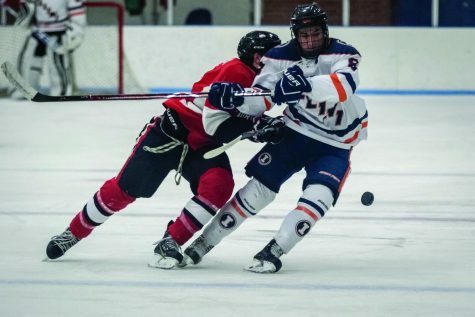 The American Collegiate Hockey Association announced this summer that 3-on-3 hockey was going to take over overtime play. 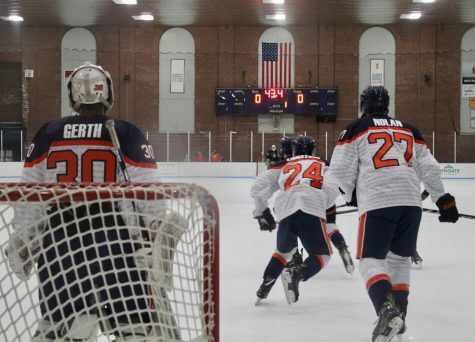 This news got mixed reactions from the players and coaches of the Illinois hockey team. Illinois coach Nick Fabbrini was one of the opponents of the rule change and let his disapproval known. 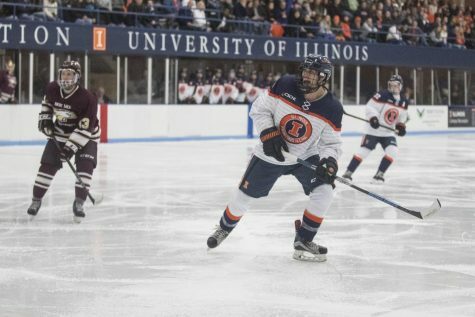 Fabbrini went on to say that if you win the opening faceoff at the Illinois Ice Arena, during a lengthy line change, you can theoretically have the puck for two to three minutes in one zone which obviously gives that team an enormous advantage in a golden-goal situation like overtime hockey. However, senior forward Eric Cruickshank was more open to the idea of 3-on-3. What Fabbrini and Cruickshank both agreed on is that this Illini team is built well to play in overtime conditions. 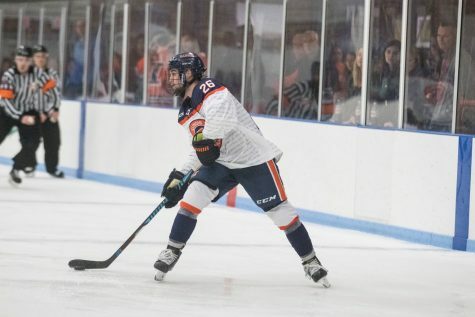 Fabbrini feels that the amount of preparation his club has on its home ice, such as 2-on-2 and 1-on-1 drills, will benefit his team well in overtime action this year, while Cruickshank said the speed and skating ability himself and teammates possess will translate well to that style of play. 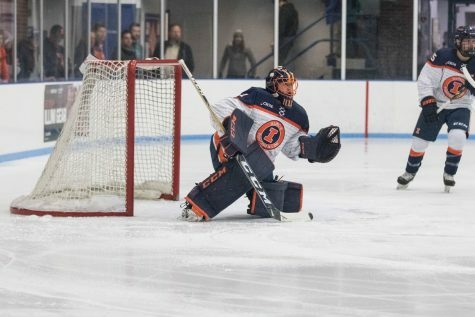 From the viewpoint of a goaltender, senior David Heflin said he does not believe the game changes much in the new overtime setting, but it allows him to be more aggressive offensively for his team. 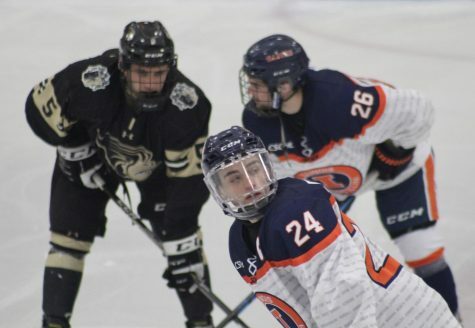 Communication still comes first for Heflin in 3-on-3 hockey. 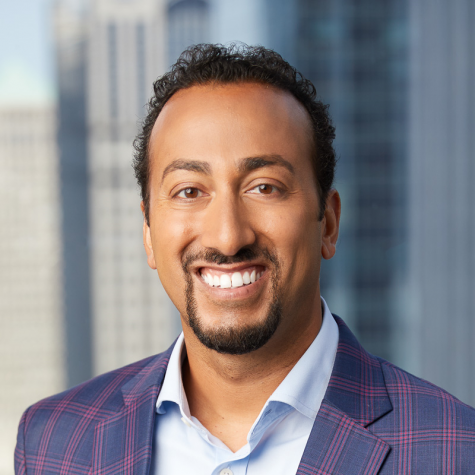 He noted that everyone is running very high on adrenaline at that point and everyone is focused on what they want to do, and he thinks it will come to benefit the Illini in overtime situations down the road. Cruickshank said the offensive perspective of players will change once overtime becomes a reality for Illinois this season. 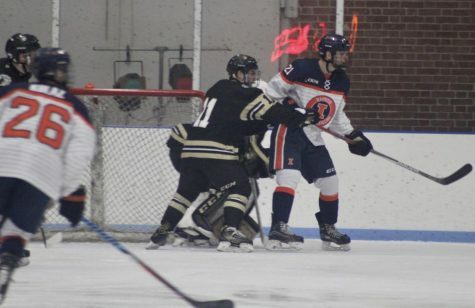 Defensively, Cruickshank said that the Illini need to treat overtime as if they are on the penalty kill. Conservative defensive play is needed and players cannot overpursue things as that can lead to disadvantages in their own zone. 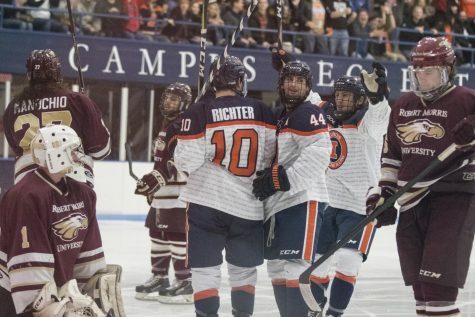 The biggest key to overtime hockey is limiting the number of turnovers, said Fabbrini.